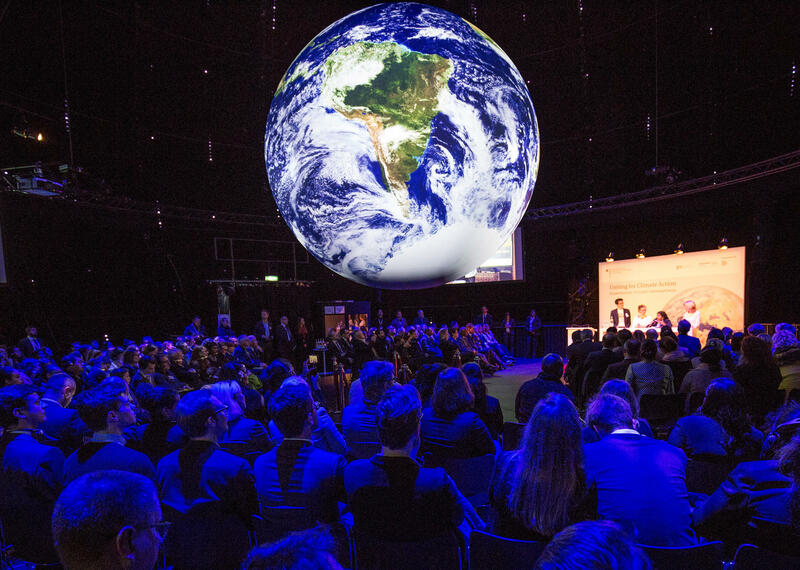 Climate conference attendees in Bonn, Germany, see a representation of Earth's climate trends. U.S. cities and states sent their own delegations as well. California Gov. Jerry Brown attended to talk about his state's commitment to climate change. "In the United States," he explained, "we have a federal system, and states have real power, as do cities. And when cities and states combine together and then join with powerful corporations, that's how stuff gets done." At that point protesters shouted over him, telling him to keep fossil fuels in the ground. But Brown's message — that states and cities have agreed to meet the Paris targets for reducing emissions on their own — has been welcomed as a stand-in for a federal effort. As diplomats debated and protesters protested, climate scientists delivered bad news. They are increasingly skeptical that the Paris deal will do what's needed. "What we actually find is that a large number of countries is in the category of weak targets and even weaker implementation," she says, "and that is specifically worrying because there are many large emitters in this weaker category." That weak target and effort category includes countries such as the U.S., Russia and China. The Paris agreement set a goal not to let the planet warm more than 3.6 degrees F above what is was before the industrial revolution. This latest analysis echoes others: the pledges made by countries in Paris to reduce emissions aren't enough, and that current energy policies aren't going to make even the Paris pledges possible. Fekete says the Carbon Action Tracker analysis shows that the climate is currently headed for an increase of at least 6 degrees F by the end of the century. Another study released this week adds more bad news. Global emissions of carbon dioxide, the main greenhouse gas, are going up. That's after three years where they remained fairly flat. Environmental scientist Robert Jackson at Stanford University is one of the study's authors and says the increase is mostly from China. "This year for several reasons their coal use has ticked back up by about 3 percent," Jackson says, "and their oil and gas use has risen even faster." China is the world's largest emitter of greenhouse gases. Emissions in the U.S., the second-largest emitter, went down this year, but not by much. And while emissions from India were lower than expected — a growth rate of only 2 percent — Jackson says it looks like that won't last. "I expect India's emissions to rise faster again." He says, "They still have hundreds of millions of people without electricity. It's a tough nut to crack." World leaders have been meeting in Bonn, Germany, over the past several days trying to work out next steps in the Paris climate agreement. President Trump says the U.S. will withdraw from that deal, though that can't happen till 2020. NPR's Christopher Joyce reports on what the rest of the world is doing. CHRISTOPHER JOYCE, BYLINE: In 2015, governments met in Paris and promised to reduce emissions of greenhouse gases. Now they're in Bonn figuring out how to do that. While diplomats negotiate in private green businesses and environmentalists crowd the hallways, the U.S. government sent a small delegation. They made one presentation on the value of clean coal that was disrupted by protesters. California Governor Jerry Brown was there to explain that American states and cities are able and willing to reduce emissions even if the federal government is not. JOYCE: Heckling by environmental protesters is a regular part of these meetings. But Brown's message that states and cities will reduce emissions on their own has been welcomed as a partial stand-in for a federal effort. As governments negotiate and protesters protest, climate scientists are increasingly skeptical that the Paris deal will do what's needed. Hanna Fekete is with the New Climate Institute. She says new research shows the targets set in Paris are weak as are efforts by countries to meet them. HANNA FEKETE: What we actually find is that the large number of countries is in the category with weak targets and even weaker implementation. JOYCE: Countries like the U.S. Russia and China. The Paris Agreement set a goal - don't let the planet warm more than 3.6 degrees Fahrenheit above what it was before the Industrial Revolution. This latest analysis echoes others. Even with the Paris deal, the way things are going, global temperature could rise by over 6 degrees by the end of the century. And scientists had even more bad news this week. Global emissions of carbon dioxide, the main greenhouse gas, are going up. That's after three years where they remained fairly flat. Environmental scientists Robert Jackson at Stanford University says the increase is mostly from China. ROBERT JACKSON: This year, for several reasons, their coal use has ticked back up by about 3 percent. And their oil and gas use has risen even faster. JOYCE: China is the world's largest emitter of greenhouse gases. Emissions in the U.S. went down this year but not by much. And the U.S. remains the second largest source. And India looks like its emissions will grow a lot. They rose by only 2 percent this year, but Jackson says that won't last. JACKSON: I expect India's emissions to rise faster again. They still have hundreds and millions of people without electricity. It's a tough nut to crack. JOYCE: One thing the delegates in Bonn appear to agree on - the pledges made in Paris will have to get tougher. Christopher Joyce, NPR News. (SOUNDBITE OF STUFF. 'S "FULINA") Transcript provided by NPR, Copyright NPR.